Move America Forward has collected millions to send care packages to US troops. But its appeals often rely on images and stories borrowed without permission, and its assets have been used to benefit political consulting firms and PACs. This story originally appeared on ProPublica, where it was co-published with The Daily Beast. Sal Russo, chief strategist of Move America Forward, pictured center-left at a Tea Party Express election night party Nov. 2, 2010, in Las Vegas. Each package for an individual service member is paid for with a $24.99 donation, the charity says, but it’s unclear what the $24.99 pays for. The items in each care package are donated, a former consultant who spoke on condition of anonymity said, and volunteers put them together. “Our volunteers pack each box to the brim,” the charity’s outreach coordinator Scott Raab told a radio show over Memorial Day weekend. Left, a photo taken from the Wisconsin Department of Military Affairs website showing a group of soldiers holding care packages from the American Legion and VFW posts in Watertown, Wisconsin. Right, one soldier from the same photo used in an email sent by Move America Forward soliciting donations. It’s the same soldier, but in the Move America Forward email, his nametag has been blurred out. 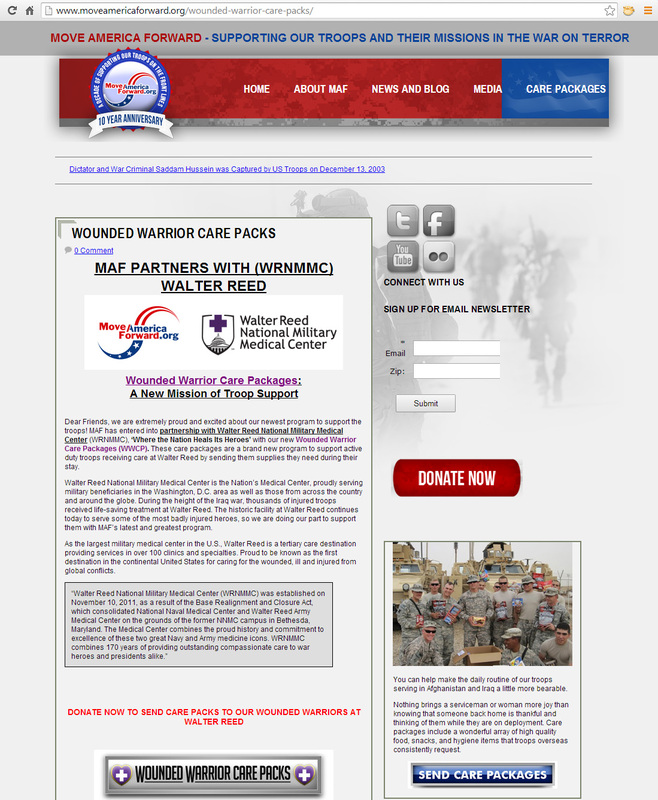 Left, an image of a soldier with a care package from Operation Gratitude originally posted on the Operation Gratitude website; right, the same image, used in an email sent by Move America Forward soliciting donations. “You’re Never Going to Believe What This Double Amputee Marine Did!” announced the subject line of an email sent Dec. 11. The message below outlined the heroics of Larry Draughn, a former Marine who lost his legs in a roadside bomb in Afghanistan but managed to help rescue stranded motorists during a snowstorm in Ohio. CHARTS: Where Did the Money Donated to Columbine, Aurora, and Virginia Tech Mass-Shooting Victims Go?